This home renovation has been an insane test of my patience. At this point, I wouldn't be surprised if you guys are feeling the pain too. BUT don't worry this isn't another post of our house framed...(and yes that's still where we are in the process humpf!). Today, I wanted to share with our design for our new master bath! To catch you guys up on the details - we've been in the middle of a home renovation for about a year and a half now. Part of this project was adding a master bath to our previously one bathroom home. You can catch up on our renovation here and see the floor plan here. I am all about clean spaces, minimalist design and order! I can be messy enough I don't need my design to be over the top or too layered. So, for our new bath, I really want it to be light and bright (read: white). 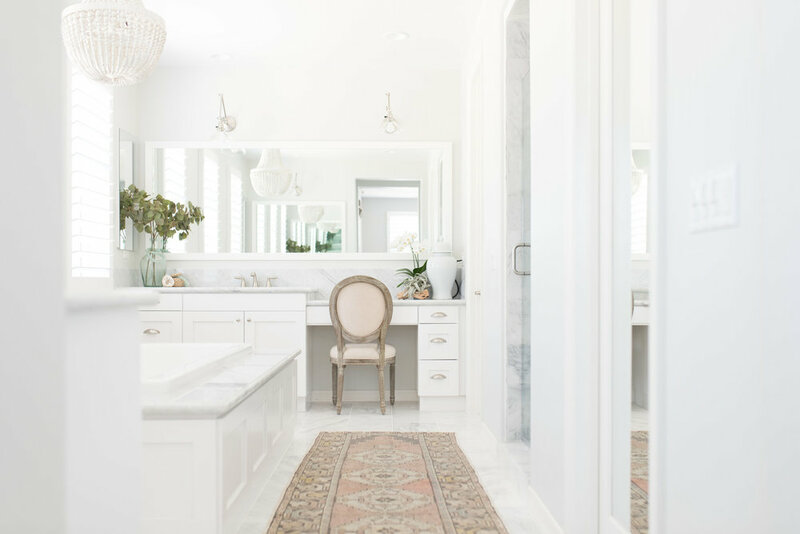 This white bathroom designed by Pure Salt Interiors is at the top of my inspiration list. It's clean and bright with lovely little details and lots of marble. Here are some of the options we looked at - all of the marble is on top here and was at best ~$9 / sq ft. While the bottom piece (which is, you guessed it porcelain) is around $6 / sq ft. Win, win. See how great the porcelain looks?! Knowing the upkeep is 100x better makes it even prettier to me. For the full design, here is what I'm thinking. 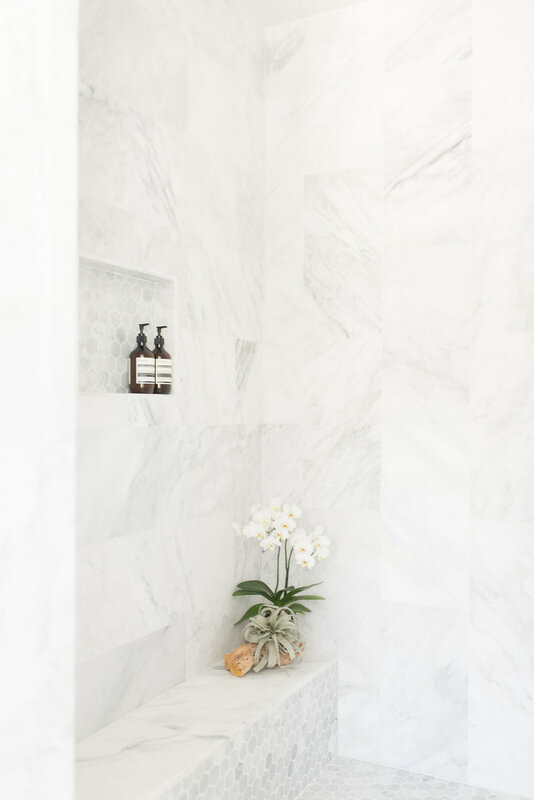 The porcelain, marble look-a-like will go on the bathroom floors and shower walls. 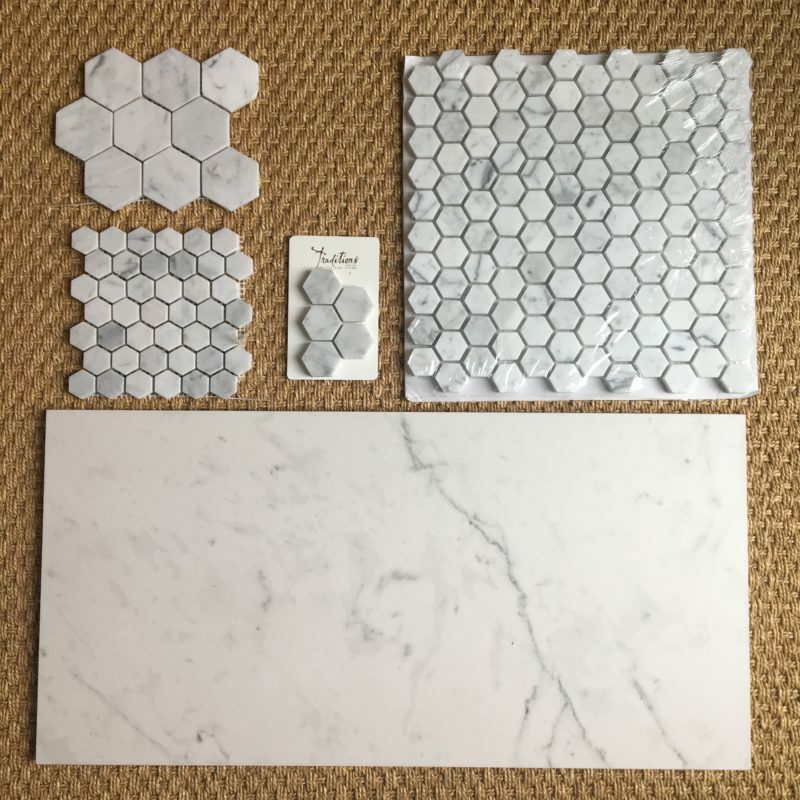 Porcelain in hex form hasn't quite been perfected, so we are daring to do marble hex on the shower floor. From there, we are picking a stream-lined vanity and traditional sconces to mix with our stand alone tub. It's going to be a tight fit, but I can't wait for the tub time! I can't wait for the walls to go up and the tiling to start! Check back next Wednesdays for more updates.